There has been so much amazing action on Instagram lately and I’ve been loving all of your feedback. This recipe was requested by you! It is one of my weeknight go-to’s. 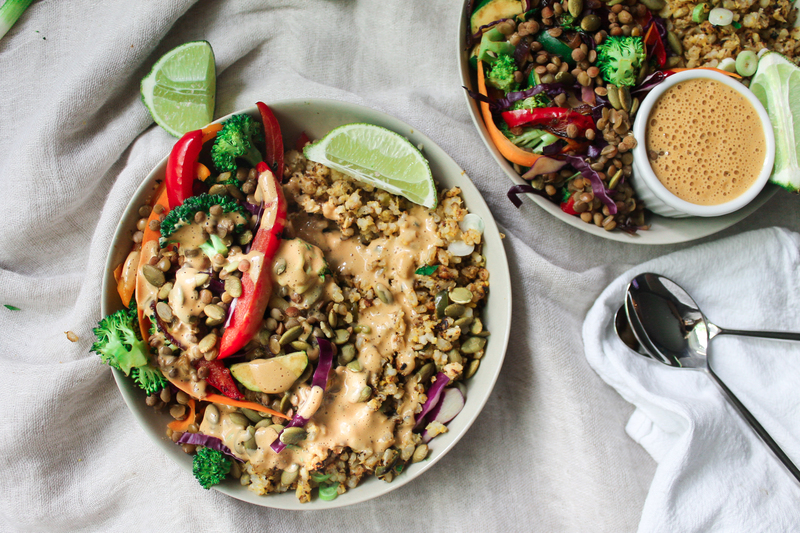 I’ve been loving having a few vegan recipes to quickly put together throughout the week. You can prepare all of the components over the weekend and utilize them in different ways throughout the week. 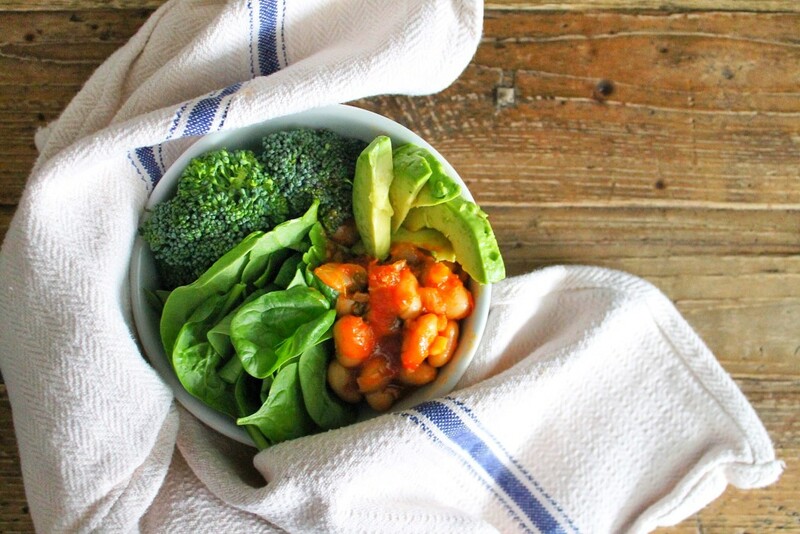 Feel free to use your favourite veg or even switch up a different bean-the possibilities are endless! 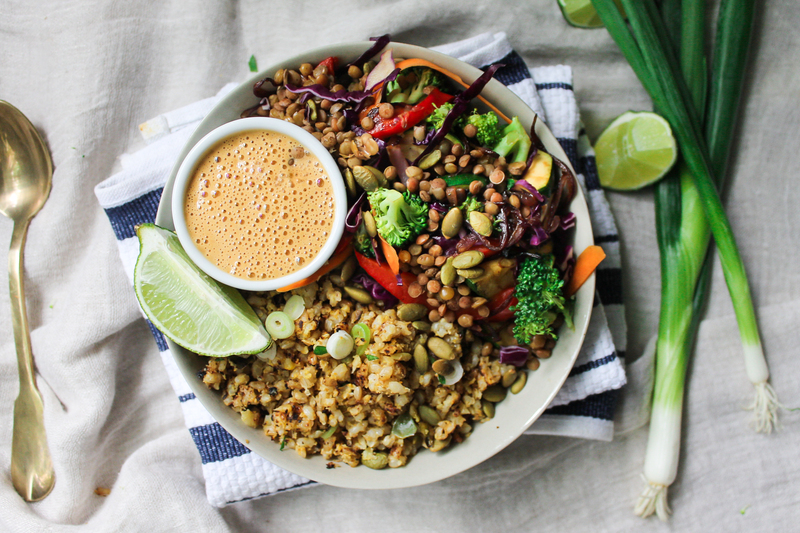 For the base of this recipe I use the crispy cauliflower brown rice that I posted last week. I make a big batch and eat it throughout the week (FYI quite delicious with fried eggs over top!). 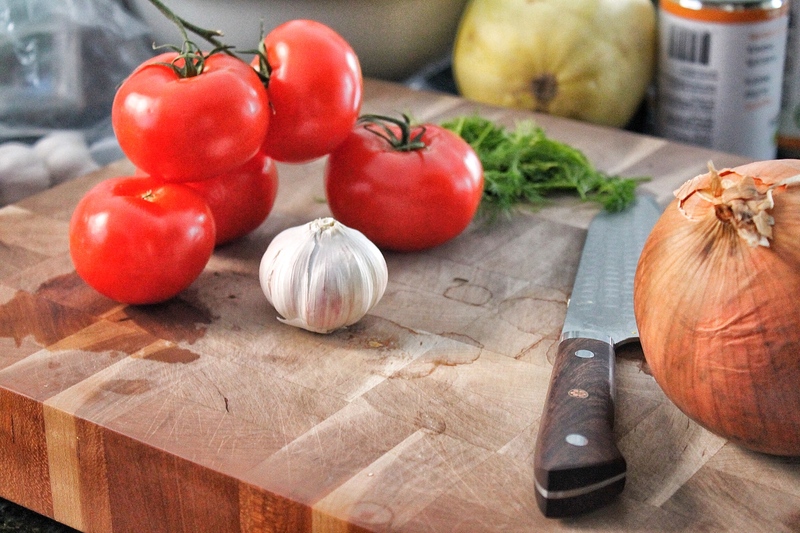 Remember that healthy eating doesn’t need to be expensive, difficult or confusing. Buy real food and spend a few hours preparing and you’re set. 1. If you are cooking your own lentils, put them on the stove first. While they are cooking, heat 1 tbsp of desired oil into a large non-stick skillet over medium/high heat. Cook red onion until they soften, season with salt and add peppers. Cook for another 5 minutes. 2. Once peppers have softened, add zucchini and cook until they begin to slightly brown. Add red cabbage and allow to soften (about 6-7 minutes). Add your broccoli, stir, and turn heat to low. 3. 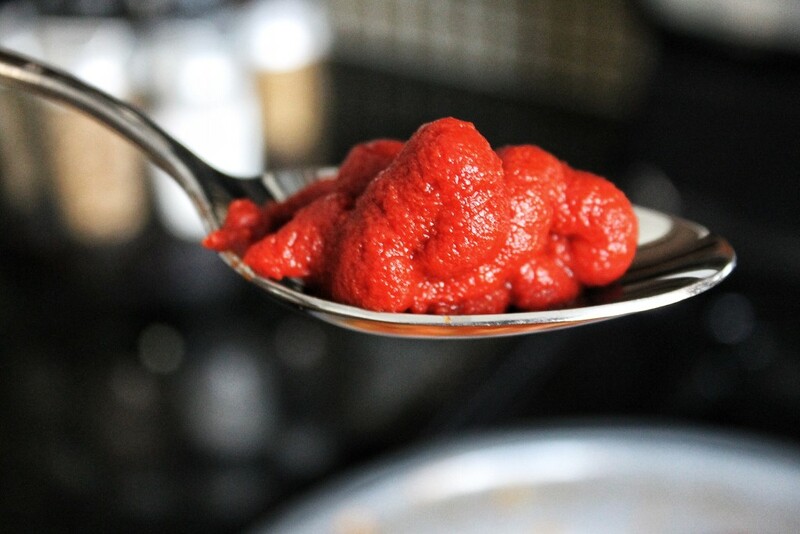 For the sauce, add all ingredients to blender and continue to pulse until smooth. 4. Time to assemble! 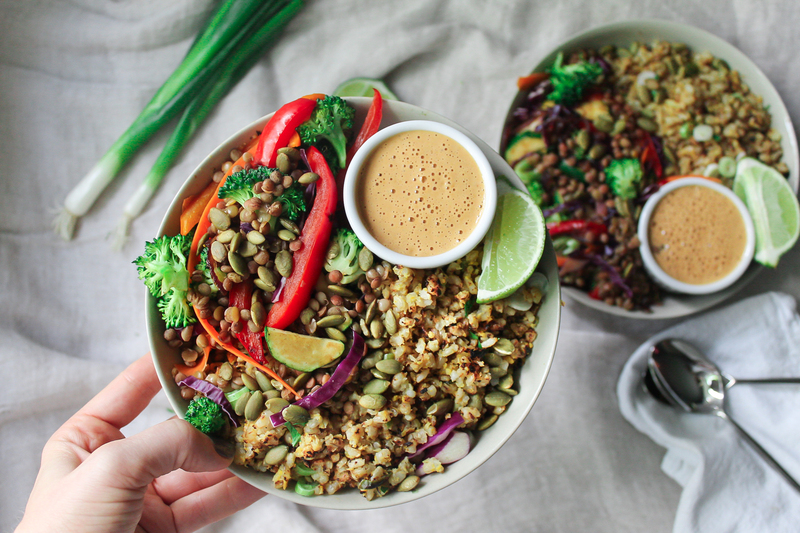 Add your cauliflower brown rice to a bowl, top with veggies, lentils, scallions and pumpkin seeds. Serve with the spicy cashew sauce and lime wedges. 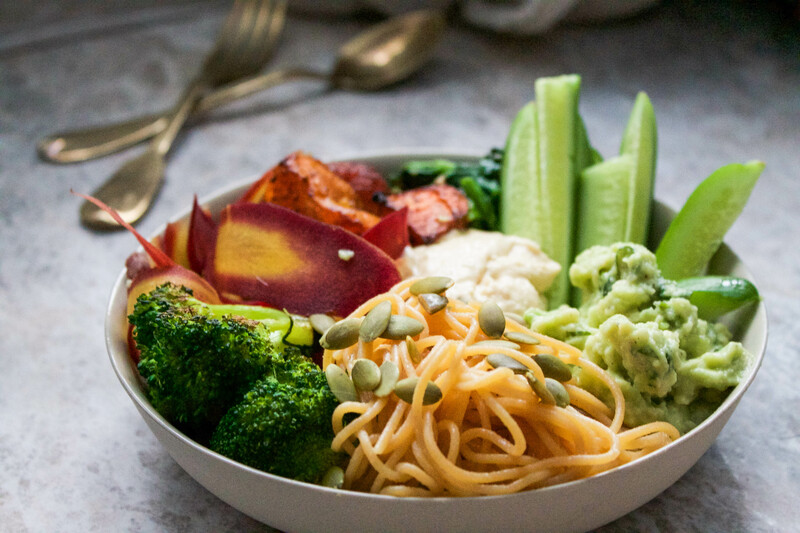 I like to prepare all the ingredients on a Sunday, and put this together throughout the week whenever I want to reach for something healthy. Happy Holidays, and hope you enjoy this throughout the season! • red lentil noodles (or any bean noodle, or bean itself will work) cooked and coated in olive oil so they won’t stick. 1. Preheat oven to 400. Place butternut squash in a roasting pan and coat with 1 tbsp olive oil (may need more depending on the size of your squash), maple syrup, sumac, 1 tsp garlic, salt and pepper. Roast for 35-45 minutes or until tender and brown on the edges. 2. In in a medium pan, heat remaining olive oil over medium heat. Cook garlic for 30 seconds then add spinach. Cook until spinach has shrunk down, season with salt and pepper and set aside. In the same pan, brown broccoli by roasting it in the pan for about 3 minutes on each side. Set aside. 3. In a small bowl, mash the avocado, fresh herbs, lime, salt and pepper until combined. Taste and adjust lime juice/seasoning to your taste. 4. 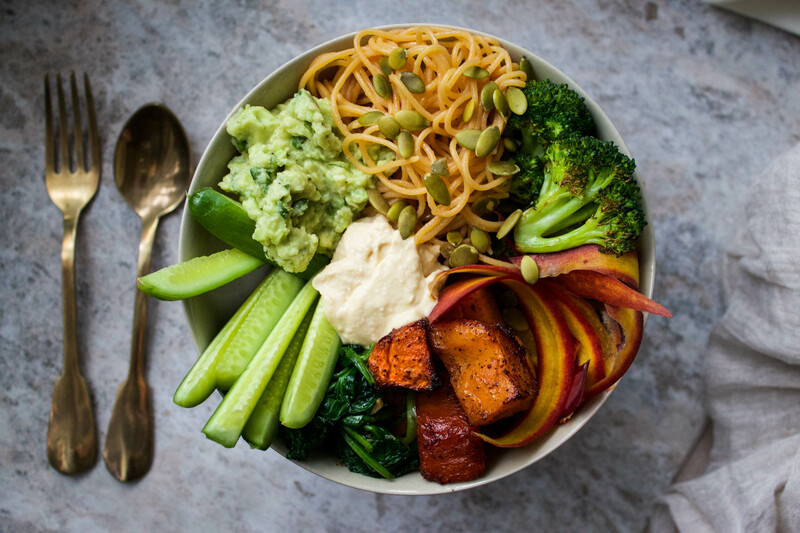 Assemble your bowl. 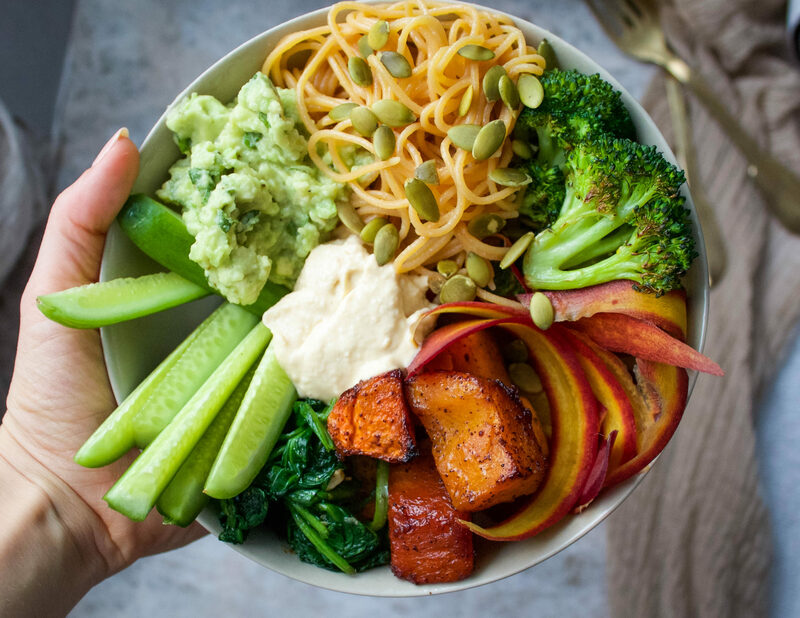 Place prepared ingredients in the bowl (squash, broccoli, spinach, noodles, avocado, carrots, cucumber) and dollop hummus in the center for dipping. Then sprinkle with crunchy toasted pumpkin seeds. I LOVE Greek food. If you leave out that delicious fried cheese and fried zucchini, Greek cuisine can actually be quite clean. The food is cooked in greek olive oils, tomato based sauces and lots of fresh herbs. My favourite part about going to Greek restaurants is those Gigantes Plaki beans. 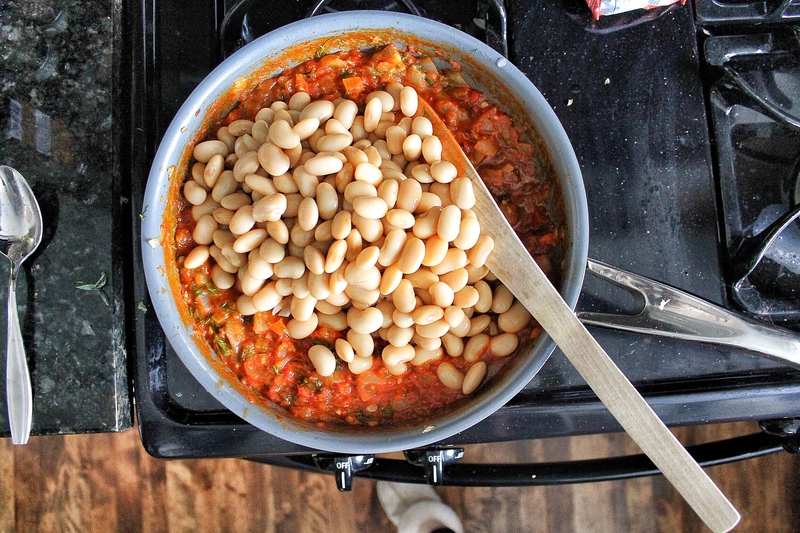 Those massive beans cooked in a dill tomato sauce is the perfect accompaniment to fish/chicken/beef and is actually delicious on top of veggies. It was time I finally recreated this recipe in my own home- and I’m so happy I did. 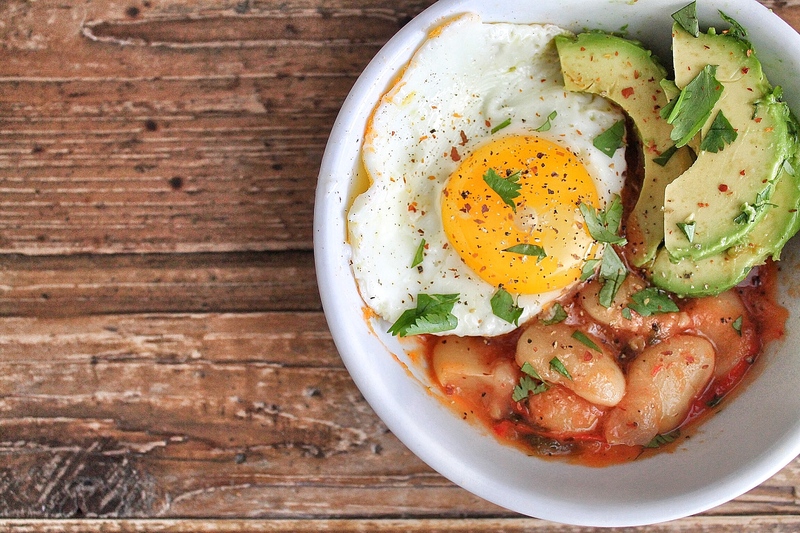 I have been eating these protein packed beans alongside all my meals these days. They are super satisfying and they add lots of flavour to generally boring dishes. Having trouble getting those raw veggies in? Throw some beans on them! Start by soaking the gigantes beans overnight in water. Rinse well.Then place the gigantes in a large pan or pot with cold water, enough to cover them, add a pinch of sea salt and bring to a boil. Turn the heat down and simmer for 45 minutes, until tender but not too soft. Drain and set aside. 2. Pulse tomatoes in a food processor until chunky. Don’t over process. 3. Heat olive oil in a sauce pan or deep oven proof skillet. Sauté onion with a pinch of salt until translucent and soft. Add garlic and saute for another minute. 4. 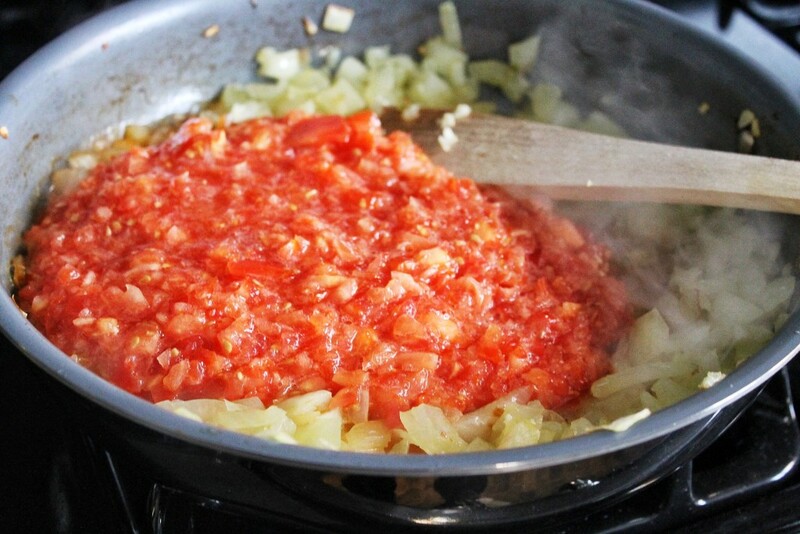 Add your crushed tomatoes to the garlic and onion. Add tomato paste and season with salt and pepper. Allow to cook for 10-15 minutes. 5.Taste your sauce, make sure its to your liking then add your beans. Add 1/2 cup fresh dill. Toss until beans are well coated and transfer to a roasting pan if your skillet/pan is not ovenproof. 6. 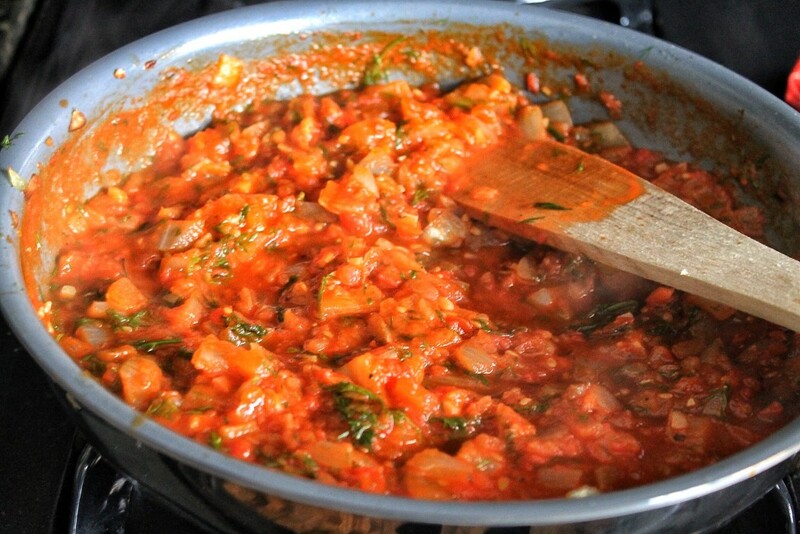 If you find your sauce is too thick, add 2 tbsp of water and stir. Place beans in the oven and bake for 45-50 minutes. Allow to cool slightly then add your remaining dill + hot sauce or chilli flakes if you desire!